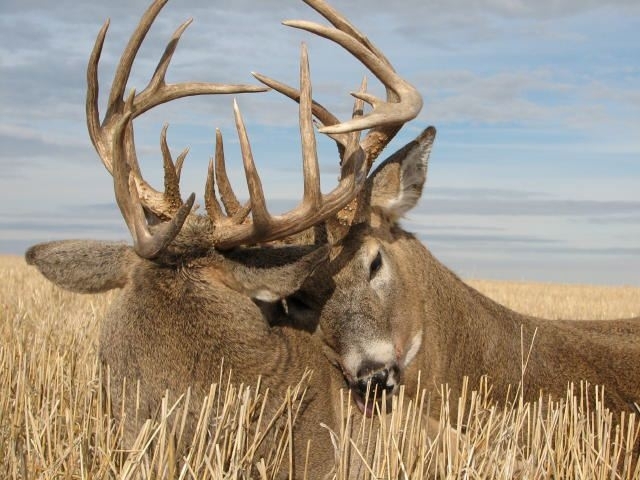 ﻿ HuntingNut » Forums » Hunting » Big Game Hunting » Two deer, one shot! Posted: Sat Mar 01, 2008 9:26 pm Post subject: Two deer, one shot! Has anyone else seen these pics. I got them in an email, which says they were shot buy a lady north of Fryburg ND. Pretty cool pics anyhow. Now if I can attach them. Posted: Sat Mar 01, 2008 9:29 pm Post subject: Re: Two deer, one shot! I just copied and pasted the text from the email. 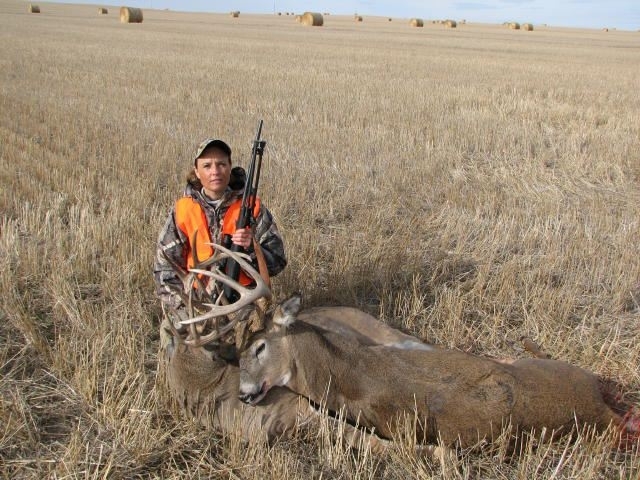 "This was shot north of Fryburg, ND opening day. The lady had been watching the pair this fall, on opening morning she spied the one buck but his head was down dragging something. He later threw his head in the air and she noticed the second buck locked on the horns. She waited till season open at 11:00 am MT (they obviously weren't going any where very fast) and she shot. Game warden was called and a special permit was given for the other buck (which was dead, but still warm)." Posted: Sat Mar 01, 2008 9:48 pm Post subject: Re: Two deer, one shot! Does her taxidermist get paid double? Posted: Sat Mar 01, 2008 9:49 pm Post subject: Re: Two deer, one shot! How in the heck would you mount that? Posted: Sat Mar 01, 2008 10:09 pm Post subject: Re: Two deer, one shot! Posted: Sun Mar 02, 2008 1:50 am Post subject: Re: Two deer, one shot! Yep that would be nice. I've seen a few locked deer mounts in this area. Posted: Sun Mar 02, 2008 10:13 am Post subject: Re: Two deer, one shot! the ones I've seen mounted in a "locked" position generally go into a corner of a room. One animal on 1 wall facing the other side, the other animal vice versa. That way you get the heads turned towards each other and it looks pretty neat. Other than that I guess it would take a pedistal mount to do it. Posted: Fri Mar 21, 2008 1:52 pm Post subject: Re: Two deer, one shot! I once watched a video were two guys came across a couple nice bucks locked up like this, one hunter ran back to the truck to get his video camera ( they were real close to the truck). After a little video fight footage the two hunters each chose a buck and fired at the same time and that ended their deer hunt. The one said it was not very much of a hunt but it was better than letting the two deer die of thirst and starvation and/or shock. Posted: Fri Mar 21, 2008 9:28 pm Post subject: Re: Two deer, one shot! WOW...that is really odd. I take it from what the others here have said that this is not an uncommon occurrence? Posted: Sat Mar 22, 2008 8:17 am Post subject: Re: Two deer, one shot! Vince, I've seen photos of whitetail bucks locked together or even hung up on a tree who died from shock/thirst. I don't know how common it is but it happens enough to see new photos every year or two. Posted: Sat Mar 22, 2008 8:30 pm Post subject: Re: Two deer, one shot! Sounds almost like another case of nature taking its course to improve the gene pool. Posted: Sun Mar 23, 2008 11:20 am Post subject: Re: Two deer, one shot! I shot 5 running coyotes with 4 shots once. That last shot was rather tricky. Wiley little buggers. Posted: Sun Mar 23, 2008 11:30 am Post subject: Re: Two deer, one shot! I've seen bucks fighting several times, but never two locked up. It must be fairly rare. I shot quite a few bucks with broken points that I assumed were broken during a fight. I've even see one with the main beam broken. I guess it would be possible for them to break an antler and come apart. The only ones that we see are the ones that don't separate.